Posted on June 4, 2012 by Elizabeth B. 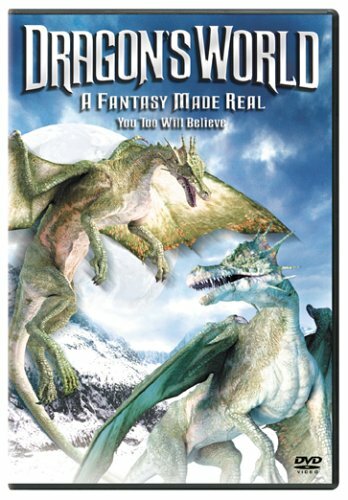 Last week, I watched the DVD of a 2004 Animal Planet special called Dragon’s World: A Fantasy Made Real. It was made to look like a real documentary, and the cover boasted that you too will believe. The graphics weren’t exactly convincing, but the story surely was. 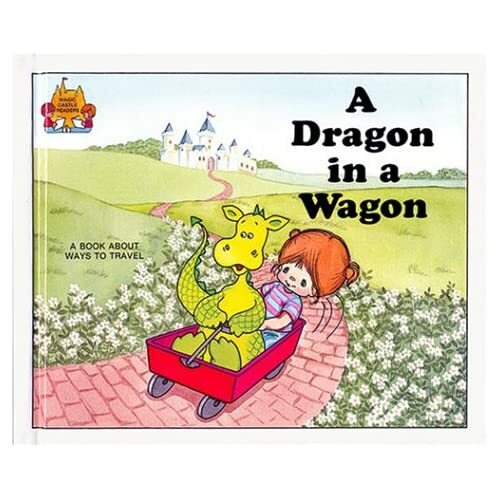 Dragon’s World shares the story of several different dragons throughout history. Between computer-generated videos of those stories and descriptions of their biology is told the tale of a modern paleontologist who discovers that a supposed dragon hoax he is trying to debunk is no hoax at all—inarguable proof of dragons has been unearthed. It feels as serious and real as any other televised nature documentary, but there is one significant difference—this one never happened. The show explained how dragons were built to fly, how they could have breathed fire, and why they declined as the human race advanced. They answered many other questions, too: Why did dragons survive when dinosaurs did not? How did they reproduce? What varieties of dragons were there? It was hard to know what was real by the time the show was over. The makers of the show say it is all a big what-if, but they put a great deal of effort into designing biological and historical support for the possibility of dragons. Why would they try to persuade their audience to believe in an animal they don’t actually think exists? Having successfully shown that dragons could have existed, why do these people still insist that they did not? You can find previews and more information about Dragon’s World: A Fantasy Made Real on Animal Planet’s website here: http://animal.discovery.com/convergence/dragons/. You can find more speculations on the existence of dragons here, on Dragon’s Crossing, sprinkled throughout future posts. Do you think dragons could be real? What makes you skeptical? Where did all the myths come from? Postscript—I apologize to those of you who were looking for a second post last week. I unexpectedly got sick, and had to postpone blogging over the weekend. Thank you for your patience! Posted on May 29, 2012 by Elizabeth B. As promised, I’m back from my Memorial Day weekend trip for a Tuesday post. I had good weather, good company, and some gorgeous scenery, but I’m happy to be back home (and back to Dragon Crossing!). I just finished reading Beowulf for the first time. Somehow, I managed to successfully graduate with an English degree without ever reading the classic poem, so I figured I should give it a go. The translation I read was Seamus Heaney’s new verse translation (with some good reviews on Amazon). It had the Old English version on every left-hand page, but this time I mainly focused on the modern line-by-line translation on the right. Beowulf the Geat sails to the land of his allies, the Danes, to free them from Grendel, a horrible monster that repeatedly comes in the night to violently slaughter people. Beowulf single-handedly defeats Grendel, and when the monster’s mother comes looking for revenge, Beowulf tracks her down and kills her, too. He goes home laden with the Danes’ treasure and gratitude. At home, Beowulf becomes king of his people and rules well for fifty years—but a third of the poem remains. When a runaway slave stumbles into a hidden treasure trove and steals a goblet, he angers the sleeping dragon who guards the stash. The dragon ravishes the land with fire, and Beowulf, now an old man, must attempt one final errand: defeat the dragon to free the treasure and save the lives of his people. With the help of one loyal youth, he kills the dragon, but not until it has fatally wounded him. After all he has accomplished, the hero finally dies, leaving the broken Geats grieving their fallen lord and fearing the trouble that will come with their protector’s death. Beowulf’s dragon is hardly the sign of a lucky year. After finding and guarding the treasure for three centuries, the dragon is angry enough at the disappearance of a single cup to spend night after night burning the Geats’ land in revenge. 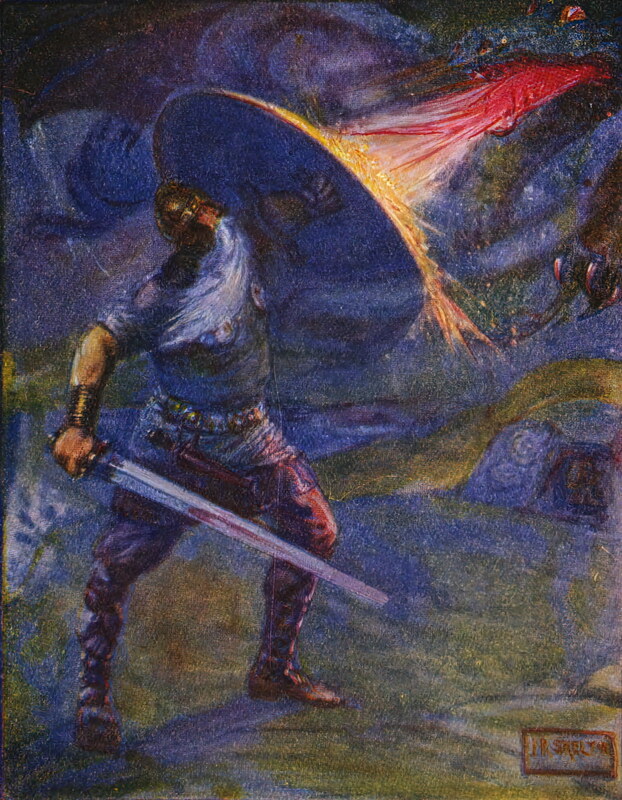 Even Beowulf, strong and fearless as he is, has a premonition that he might die while facing the beast. This dragon is a writhing, looping serpent that can fly and breathe fire. Its scales are so hard that Beowulf cannot cut through its neck, and its body is a scorched color. Most unique are its fangs: this dragon, instead of just toasting the hero, sinks fangs into Beowulf’s neck. The dragon’s bite is toxic—after it is defeated, Beowulf feels the poison in his body as the wound swells and bleeds. Beowulf wasn’t wrong to defend his people, but was the dragon so wrong in defending its treasure? In the end, certainly, nobody mourns its death. Beowulf gets a fine funeral, but the shimmering, 50-foot serpent gets tossed off a cliff into the sea without a second thought. If you haven’t read the poem, I encourage you to check it out—it’s a reasonably quick read, it’s the epic story of a great hero, and the dragon fight is as well-written as a reader could hope for. I borrowed a copy from the library, but if you’re a Nook or Kindle user, both Amazon and Barnes & Noble have free electronic copies of older Beowulf translations that you can download. When you read it (or if you already have), let me know what you think of the great dragon that proved to be Beowulf’s bane. Posted on May 25, 2012 by Elizabeth B.
I’m already breaking my designated blogging schedule. Since I’m out of town for Memorial Day weekend, I will be bumping Monday’s post to Tuesday and Wednesday’s post to Thursday next week. I could have prewritten Monday’s post, but the sunny outdoors called, so I planted my garden instead. There you have it: Dragon Crossing’s first excuse. What could that be, lurking up there by the ceiling? Sure enough, it was a dragon! It didn’t look terribly friendly, though, so I didn’t get too close. Thank you ahead of time for your patience, and check back again on Tuesday! 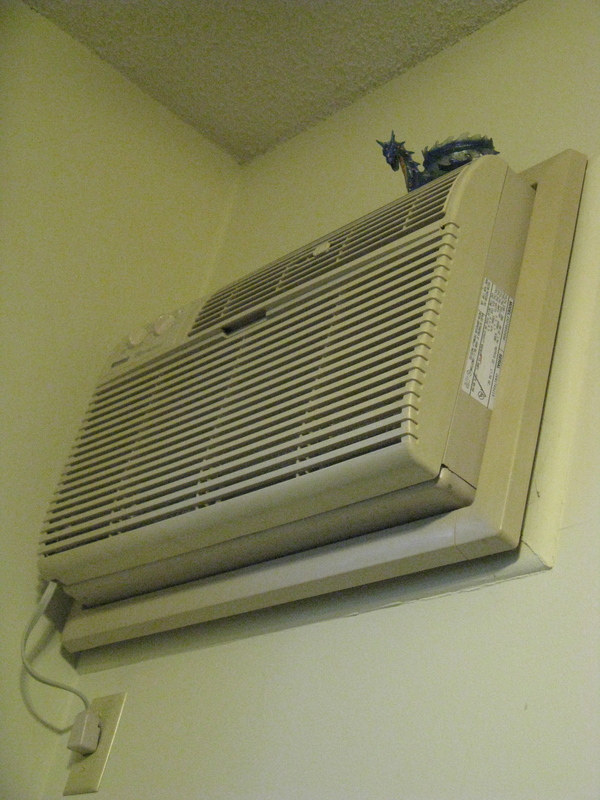 Posted on May 23, 2012 by Elizabeth B.
It’s the right year to start a blog about dragons. 2012: The Year of the Dragon. Image borrowed from the Wikimedia Commons. As a kid, all I knew of the zodiac was printed on cheap paper placemats at so many Chinese restaurants. It was simple entertainment: find my birth year, find my animal, and decide if I thought it matched me. My sister and I laughed plenty at the results—the animals were hilarious when we were small, and the descriptions hardly fit. It wasn’t until later that I found out that there were people for whom it wasn’t a laughing matter—I heard words like horoscope and astrology and learned that some people—many people, even—take the zodiac seriously, letting it guide them in decisions like what job to pursue or who to marry or tell them how their life is going to go. They say 2012 is a lucky year to be born—it’s the Year of the Dragon according to the Chinese zodiac. Parents want their children to be born Dragons, for Dragons are accomplished, intelligent. They’re also said to be magnanimous, self-assured, passionate, generous, compelling, and sentimental. On the flip side, Dragons can be arrogant, ruthless, opinionated, stubborn and demanding—but hey, at least they’re gifted. Are you a Dragon? If you were born in 1916, 1928, 1940, 1952, 1964, 1976, 1988, or 2000, you just might be! Take note if you have a January or February birthday, though—the Chinese New Year doesn’t coincide with our calendar, so those years officially start and end somewhere between late January and early February. You might actually belong to the previous year, or you might be a Dragon even though you were born in January of the next year! Whether you pay attention to your Chinese zodiac animal or not is up to you. Whether the rest of 2012 turns out to be a lucky year or just another 366 days full of life with its ups and downs, I guess we’ll see. 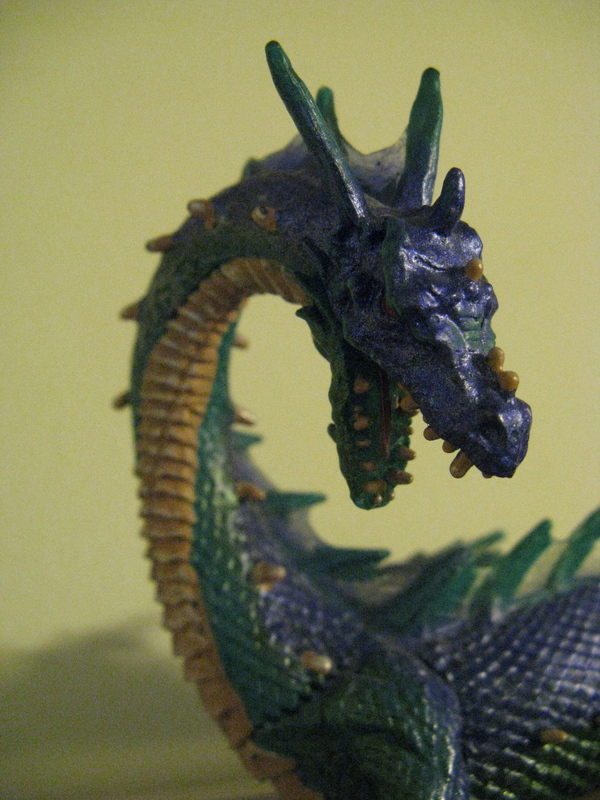 In any case, the Year of the Dragon is a great time to start a dragon blog. Posted on May 21, 2012 by Elizabeth B. Why a blog about dragons? It’s an idea that has been developing in my brain since March. I had an itch to start a writing project, a place where I could write about something I love. I could start a fresh conversation (not book blog #1891, with all due respect—I do love hearing what my friends have been reading!) with friends and strangers alike, centered on something we all cared about. Settling on dragons wasn’t hard. I have many a friend who loves them, they’re an important part of the current cultural obsession with fantasy, and perhaps most importantly, my own interest has me eager to learn more even as I write. I did multiple Google and WordPress searches without finding a single other blog devoted to dragons (though if you have one or know of one, send me the link!). Even more sadly, I wasn’t impressed with any of the dragon sites I could find outside of Wikipedia—there were a few directories such as Here Be Dragons and Dragons Must Be Here, but they were neither extensive nor well-updated. If there are other sites out there that didn’t make my search, I’d love to see them. For now, though, I’m hoping that Dragon Crossing will be a fairly unique place to bring film, literature, history, myth, fad, science, and art together in a conversation that is all about dragons. What’s coming on this site? Every Monday and Wednesday, and maybe the odd bonus day now and then, I’ll put up a new post about dragons (obviously!). It might be a Chinese tradition, a Western tale, or a new dragon-filled movie I just watched. Other days, I’ll be talking about dragon sculptures, the newest fantasy stories, and some of the evidence for—or maybe against—the existence of real dragons. But that’s not all! Do you have a favorite dragon story? Have you been wondering what a wyvern is? Do you want to know how to draw a dragon? If it’s related to dragons, it will probably wind up on Dragon Crossing in one form or another. I’ll try to clearly tag posts for easy searching later, and I’ll always take suggestions for what other dragon facts really ought to be included. I should also mention that I’m not trying to corner the market on dragon information—if I find another great website or book, I’ll make sure I share it. Whether you love them as fantasy creatures, want to learn more about their place in mythology and culture, or are just curious in general, I invite you to come along for the adventure as I pull together a hoard of facts, stories, and pictures at this Dragon Crossing. Thanks for joining me!